When Bishop Jennifer Baskerville-Burrows visited Trinity Church in Lawrenceburg last November, the Rev. Mary Taflinger, Trinity’s rector, asked her if she’d had a chance to visit the National Underground Railroad Freedom Center in nearby Cincinnati. When the bishop said she hadn’t, but would like to, Taflinger invited her to visit the museum with her parish, and later extended the invitation to other churches in the Southeast Deanery. 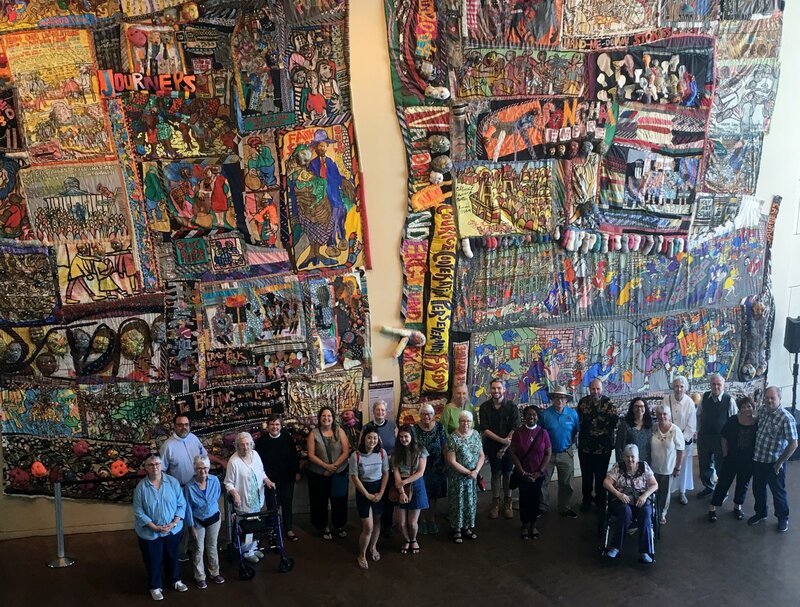 In June, about 25 Episcopalians from Trinity and Christ Church in Madison, along with several members of Tikkun Farm in Cincinnati, joined Baskerville-Burrows for a tour of the museum. Some participants read “Jesus and the Disinherited” by Howard Thurman in preparation. The center, opened in 2004, describes itself as “a museum of conscience, an education center, a convener of dialogue, and a beacon of light for inclusive freedom around the globe.” It sits within site of the Ohio River, which, before the Civil War, was the last natural barrier confronting enslaved people fleeing the south. Exhibits include From Slavery to Freedom, which portrays three centuries of slavery in North America; Escape! Freedom Seekers and the Underground Railroad and Invisible: Slavery Today. Perhaps the most visually compelling was And Still We Rise, a series of handcrafted quilts created by an international group of artists from the Women of Color Quilters Network narrating the history of the African American experience. “I think a lot of people were sort of astonished at what we saw,” Wheeler said. “We knew this history existed, but we hadn’t come face to face with it. “They have this little building inside the museum that used to be a slave holding pen and hearing that history and hearing them talk about how the men were up above and the women were down below and just imagining what it would have been like to be in that space was very moving,” she said, referring to an exhibit called The Slave Pen, a two-story structure found in the mid-19th century on a slave trader’s farm in Kentucky. The diocesan delegation found its tour guide not as historically grounded as they had hoped. But Baskerville-Burrows, who had visited the museum with the annual Bishops Executive Secretaries Together gathering not long after the invitation from Taflinger, was able to fill in some of the gaps. She drew primarily on her experiences on an Episcopal Relief & Development pilgrimage to the Cape Coast of Ghana. The visit had a profound impact on participants. “I talked with folks individually who went and had this email conversation with one of the folks who went who said, ‘I went in thinking that I understood the slave experience and I realized I had not a clue,’” Taflinger said. “She thought she could empathize, but she realized she was wrong. She realized there was nothing in her life that could remotely compare to what the slaves had endured. Wheeler and Taflinger said the question that confronts church groups, after any such emotionally charged visit is, what do we do now? Answers are just being formulated in Madison and Lawrenceburg. Madison has been the site of three Ku Klux Klan rallies since 2016, most recently on Labor Day. Wheeler is part of a small group of clergy and educational leaders trying to bring attention to more redemptive elements of the county’s history. The former Eleutherian College in nearby Lancaster, founded in 1848 was the first college in the state to admit male and female students regardless of race. In 1860, a quarter of the school’s 200 students were black at a time when the state constitution prohibited black immigration into the state. The group Historic Eleutherian College is working to raise the profile of the school, which is now a museum and a national landmark. In addition, Wheeler and leaders of several interested organizations are discussing strategies to persuade people to leave the Klan and to promote racial reconciliation and healing. Christ Church, Madison has invited Trinity Church in Lawrenceburg to come for a visit and a tour of the Madison area which, in addition to the college, includes an underground railroad site.